Successfully Added Hystou FMP06 Mini PC – Licensed Windows 10, Intel Skylake CPU, 16GB DDR4 RAM, 4K Support, Fan-Less Cooling, WiFi, 128GB ROM to your Shopping Cart. With its Intel HD Graphics 520 unit, your Windows Mini PC is capable of setting forth breath taking visuals. This compact computer furthermore supports 4K video play which means that you can enjoy all your favorite films, series, and sports games and breath-taking Ultra-HD resolution. Within its sleek metal body, the Hystou FMP06 mini PC boasts a passive cooling system that replaces the traditional noisy fans. This piece of equipment will keep your mini PC cool without distracting you while you’re watching a movie, playing a game, or finishing up your work. Simply connect your mini PC to any display, keyboard, and mouse – and you’re ready to go. With its portable and lightweight design, you’ll be able to easily carry along your files and entertainment anywhere you go. This Windows mini PC runs on a licensed version of Windows 10. This means that you’ll be able to make use of all the latest MS Office features. The 128GB internal storage of this mini computer offers plenty of space for you to keep your files and media. Additionally, it features a whopping 1TB or more extended memory capacity. Thanks to this, you’ll never have to worry again about running out of storage for games, movies, and work files. With its ultra-fast WiFi connectivity, your mini PC lets you browse the web, play online games, and engage in lag free video calls with friends and colleagues at any given moment. Whether you’re a business man, gamer, or designer – this powerful Windows mini PC is the ultimate gizmo for you. 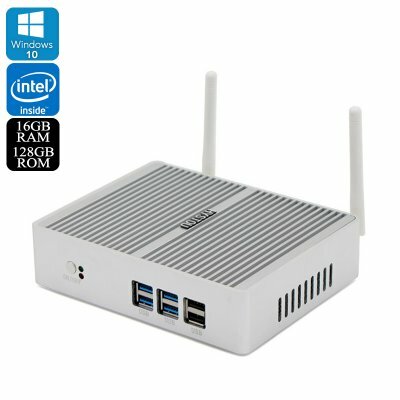 TheHystou FMP06 mini PC comes with a 12 months warranty, brought to you by the leader in electronic devices as well as wholesale mini computers..